عباسی, عباس, الماسی, علی اکبر, اصغری جهرمی, سمانه. (1397). ارائه روش کمی اندازه‌گیری درجه تناسب فرد-سازمان با استفاده از روش ANP. مطالعات رفتار سازمانی, 7(1), 137-162. عباس عباسی; علی اکبر الماسی; سمانه اصغری جهرمی. "ارائه روش کمی اندازه‌گیری درجه تناسب فرد-سازمان با استفاده از روش ANP". مطالعات رفتار سازمانی, 7, 1, 1397, 137-162. عباسی, عباس, الماسی, علی اکبر, اصغری جهرمی, سمانه. (1397). 'ارائه روش کمی اندازه‌گیری درجه تناسب فرد-سازمان با استفاده از روش ANP', مطالعات رفتار سازمانی, 7(1), pp. 137-162. عباسی, عباس, الماسی, علی اکبر, اصغری جهرمی, سمانه. ارائه روش کمی اندازه‌گیری درجه تناسب فرد-سازمان با استفاده از روش ANP. مطالعات رفتار سازمانی, 1397; 7(1): 137-162. 2کارشناس ارشد MBA، دانشکده اقتصاد، مدیریت و علوم اجتماعی، پردیس بین الملل دانشگاه شیراز، شیراز، ایران. 3کارشناس ارشد مدیریت منابع انسانی، دانشکده اقتصاد، مدیریت و علوم اجتماعی، دانشگاه شیراز، شیراز، ایران. هدف از نگارش مقاله حاضر، شناسایی و انتخاب مدلی مناسب جهت سنجش درجه تناسب فرد - سازمان از ادبیات موضوع، تعیین وزن شاخص­های مدل­ مذکور و درنهایت ارائه روشی کمی برای اندازه­گیری درجه تناسب دوسویه فرد - سازمان است. در این راستا، ابتدا شاخص­ها و مدل‌های مختلف تناسب فرد – سازمان مورد بررسی قرار گرفت. سپس جلسه­ای به‌صورت گروه متمرکز برای دسته­بندی شاخص­ها برگزار شد و درنهایت مدل تناسب دوسویه فرد - سازمان کریستف جهت بررسی این مفهوم انتخاب شد. در گام بعد از طریق دیمتل و فرایند تحلیل شبکه، وزن شاخص­ها و روابط بین آنها تعیین شد. نتیجه این پژوهش، ارائه هفده شاخص برای ارزیابی افراد از سازمان­ها و هفده شاخص نیز برای ارزیابی سازمان­ها از افراد شناسایی و وزن­های آنها با استفاده از تکنیک فرایند تحلیل شبکه بوده است. براساس نتایج، در ارزیابی سازمان­ها از دیدگاه افراد، ارزش­های سازمان و پس‌ازآن کارایی، قدرت تأثیر و اهداف سازمان دارای بیشترین وزن­ها بوده‌اند. همچنین در ارزیابی افراد از دیدگاه سازمان­ها، گرایش­های شخصی و پس‌ازآن ارزش­ها، شخصیت و اهداف فردی، دارای بیشترین وزن بوده‌اند. رواقی،حمید؛ شمس، لیدا؛ آرین‌خصال، آیدین و صالحی، مسعود (1392)، تناسب فرد- سازمان و تعهد سازمانی کارکنان بیمارستان‌های آموزشی دانشگاه علوم پزشکی تهران، مجله مدیریت اطلاعات سلامت، دوره دهم، شماره سوم: 1-11. قلی­پور، آرین؛ روشن‌نژاد، مژگان و شرافت، شاپور (1389)، تبیین تناسب فرد- سازمان به‌عنوان عاملی اثرگذار در بیگانگی از کار و پیوند کار، اندیشه راهبردی، دوره چهارم، شماره یکم: 209-229. ناصری محمدآبادی، علی؛ نوری، ابوالقاسم؛ عسکری، آزاده؛ صادق، رباب و ستوده، علی (1392، رابطه ابعاد تناسب فرد- محیط با برون‌دادهای سازمانی در پرستاران بیمارستان­های دولتی شهر اصفهان، مدیریت اطلاعات سلامت، دوره دهم، شماره هفتم: 1085-1094. Arbour, S., Kwantes, C. T., Kraft, J. M. & Boglarsky, C. A. (2014). Person-organization fit: Using normative behaviors to predict workplace satisfaction, stress and intentions to stay. Journal of Organizational Culture, Communications and Conflict, 18(1): 41. Abzari, M., Kabiripour, V. & Saeidi, A. (2015). The effect of business ethical values on turnover intention: mediating role of person-organization fit dimensions. The case of Iranian teachers in public school. Academic Journal of Economic Studies, 1(1): 65-81. Ambrose, M. L., Arnaud, A. & Schminke, M. (2008). Individual moral development and ethical climate: The influence of person–organization fit on job attitudes. Journal of Business Ethics, 77(3): 323-333. Arthur J. W., Bell, S. T., Villado, A. J. & Doverspike, D. (2006). The use of person-organization fit in employment decision making: an assessment of its criterion-related validity. Journal of applied psychology, 91(4): 786. Brigham, K. H., De Castro, J. O. & Shepherd, D. A. (2007). A Person‐Organization Fit Model of Owner-Managers' Cognitive Style and Organizational Demands. Entrepreneurship theory and practice, 31(1): 29-51. Bright, L. (2007). Does person-organization fit mediate the relationship between public service motivation and the job performance of public employees?. Review of public personnel administration, 27(4): 361-379. Carless, S. A. (2005). Person–job fit versus person–organization fit as predictors of organizational attraction and job acceptance intentions: A longitudinal study. Journal of Occupational and Organizational Psychology, 78(3): 411-429. Chatman, J. A. (1989). Matching people and organizations: Selection and socialization in public accounting firms. In Academy of Management proceedings, 1: 199-203. De Cooman, R., De Gieter, S., Pepermans, R., Hermans, S., Du Bois, C., Caers, R. & Jegers, M. (2009). Person–organization fit: Testing socialization and attraction–selection–attrition hypotheses. Journal of Vocational Behavior, 74(1): 102-107. Dineen, B. R., Ash, S. R. & Noe, R. A. (2002). A Web of applicant attraction: person-organization fit in the context of Web-based recruitment. Journal of Applied Psychology, 87(4): 723. Farooqui, M. S. & Nagendra, A. (2014). The impact of person organization fit on job satisfaction and performance of the employees. Procedia economics and Finance, 11: 122-129. Han, T. S., Chiang, H. H., McConville, D. & Chiang, C. L. (2015). A longitudinal investigation of person–organization fit, person–job fit, and contextual performance: The mediating role of psychological ownership. Human Performance, 28(5): 425-439. Hoffman, B. J. & Woehr, D. J. (2006). A quantitative review of the relationship between person–organization fit and behavioral outcomes. Journal of Vocational Behavior, 68(3): 389-399. Kennedy, M. (2005). An integrative investigation of person-vocation fit, person-organization fit, and person-job fit perceptions. Dissertation, Denton, Texas. Kilroy, S., Flood, P. C., Bosak, J. & Chênevert, D. (2016). Perceptions of High‐Involvement Work Practices, Person‐Organization Fit, and Burnout: A Time-Lagged Study of Health Care Employees. Human Resource Management, 56(5): 821-835. KRISTOF‐BROWN, A. L. (2000). PERCEIVED APPLICANT FIT: DISTINGUISHING BETWEEN RECRUITERS'PERCEPTIONS OF PERSON‐JOB AND PERSON‐ORGANIZATION FIT. Personnel Psychology, 53(3): 643-671. Lauver, K. J. & Kristof-Brown, A. (2001). Distinguishing between employees' perceptions of person–job and person–organization fit. Journal of vocational behavior, 59(3): 454-470. 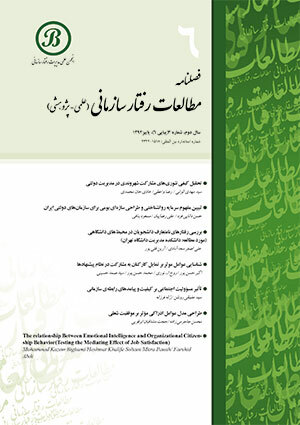 Memon, M. A., Salleh, R., Baharom, M. N. R. & Harun, H. (2014). Person-organization fit and turnover intention: The mediating role of employee engagement. Global Business and Management Research, 6(3): 205. Resick, C. J., Baltes, B. B. & Shantz, C. W. (2007). Person-organization fit and work-related attitudes and decisions: examining interactive effects with job fit and conscientiousness. Journal of applied psychology, 92(5): 1446. Resick, C. J., Giberson, T. R., Dickson, M. W., Wynne, K. T. & Bajdo, L. M. (2013). Person–organization fit, organizational citizenship and social–cognitive motivational mechanisms. Organizational fit: Key issues and new directions, 99-123. Risman, K. L., Erickson, R. J. & Diefendorff, J. M. (2016). The Impact of Person-Organization Fit on Nurse Job Satisfaction and Patient Care Quality. Applied Nursing Research, 31: 121-125. Ruiz-Palomino, P., Martínez-Cañas, R. & Fontrodona, J. (2013). Ethical culture and employee outcomes: The mediating role of person-organization fit. Journal of Business Ethics, 116(1): 173-188. Saraç, M., Efil, I. & Eryilmaz, M. (2014). A study of the relationship between person-organization fit and employee creativity. Management Research Review, 37(5): 479-501. Sekiguchi, T. (2004). Person-organization fit and person-job fit in employee selection: A review of the literature. Osaka keidai ronshu, 54(6): 179-196. Silverthorne, C. (2004). The impact of organizational culture and person-organization fit on organizational commitment and job satisfaction in Taiwan. Leadership & Organization Development Journal, 25(7): 592-599. Sökmen, A., Bitmis, M. G. & Üner, M. M. (2015). The mediating role of person-organization fit in the supportive leadership-outcome relationships. Ekonomie a Management, (3): 62. Vianen, A. E. (2000). PERSON‐ORGANIZATION FIT: THE MATCH BETWEEN NEWCOMERS'AND RECRUITERS'PREFERENCES FOR ORGANIZATIONAL CULTURES. Personnel psychology, 53(1): 113-149. Westerman, J. W. & Cyr, L. A. (2004). An integrative analysis of person–organization fit theories. International Journal of Selection and Assessment, 12(3): 252-261. Yu, K. Y. T. (2014). Person–organization fit effects on organizational attraction: A test of an expectations-based model. Organizational Behavior and Human Decision Processes, 124(1): 75-94. Xue, C., Yang, Y., Yang T. & Zeng T. (2014). Person – organization fit evaluatin and process optimization based on the matchiry theory. Computer modelling and new technologies, 18(5): 174 –180.